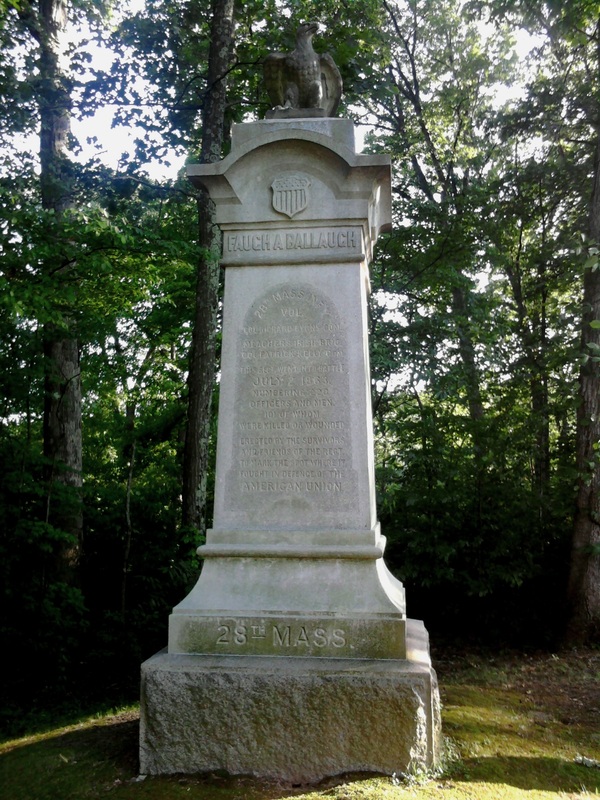 The monument of the 28th Massachusetts was placed in 1885 and is located along Sickles Avenue in the Rose Woods. During the Battle of Gettysburg, the 28th Massachusetts Infantry was part of Second Brigade (Kelly), First Division (Caldwell) of the II Corps (Hancock). The 28th Massachusetts had been formed at Camp Cameron in North Cambridge in September 1861. The regiment was one of two Bay State units made up primarily of Irish immigrants (the other being the 9th Massachusetts Infantry). They departed the Commonwealth on January 11, 1862 and became part of Brig. Gen. Thomas Sherman’s Expeditionary Corps serving in operations along the coast of South Carolina. In July 1862, the regiment was transferred to the Army of the Potomac and became part of the IX Corps. They saw hard combat during Second Bull Run (their first big engagement of the war) and its aftershock, the Battle of Chantilly. In September, they saw action during the Battle of Antietam with the IX Corps beyond Burnside’s Bridge. In the weeks following Antietam, the unit suffered from a serious lack of discipline. Massachusetts Governor John Andrew decided that a change of leadership was necessary and appointed Colonel Richard Byrnes, an Irish-born Regular Army officer, as commander. This caused considerable upheaval within the regiment. Many officers of the 28th Massachusetts, resenting the appointment of an outsider and feeling that they had been passed over for promotion, sent a petition of protest to the Governor. This was to no avail. Byrnes would prove to be a highly capable regimental commander, though the heated strife between him and his subordinate officers (sometimes insubordinate, according to Byrnes) would continue for months. In November 1862, the 28th Massachusetts was transferred within the Army of the Potomac to the famed Irish Brigade, part of the II Corps. There had been hopes and rumors, when the regiment was first formed, that they would be a part of this proud brigade and when the transfer finally occurred, it was much to the satisfaction of the men in the 28th Massachusetts. Sadly, as part of the Irish Brigade, the 28th Massachusetts suffered terribly during the Battle of Fredericksburg as they advanced to within 50 yards of the stone wall under hellish fire. At Chancellorsville they were not heavily engaged but rescued the guns of the 5th Maine Battery after that unit had been so decimated that they did not have enough men to withdraw their pieces. By the time of Gettysburg, the 28th Massachusetts had been worn down to just 220 rifles. Even so, they made up roughly half of the brigade–the other four regiments having been all but used up. The days preceding the battle saw hard marching through awful heat for the Army of the Potomac. On June 29 alone, the Irish Brigade marched 34 miles. They reached Gettysburg around 5 a.m. on July 2, 1863 via the Taneytown Road. By 7 a.m. that morning, they were in position on Cemetery Ridge with the rest of the II Corps. Confederate General Longstreet’s massive assault on the Union left flank finally got underway around 4 p.m. The men of the 28th Massachusetts waited in place on Cemetery Ridge, at the center of the long Union line, and listened as the III and V Corps (almost a mile to the southwest) fought furiously. As the Union lines began to falter, Maj. Gen. Winfield Scott Hancock, commanding the II Corps, received a plea to send reinforcements off to the left. 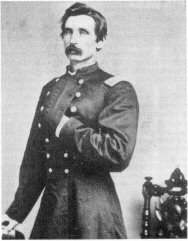 Hancock chose Caldwell’s Division, of which the Irish Brigade was a part. The 28th Massachusetts received the order to fall in and prepared to head into the fray. There are yet a few minutes to spare before starting, and the time is occupied by one of the most impressive religious ceremonies I have ever witnessed…The brigade stood in column of regiments, closed in mass…While this is customary in the armies of Catholic countries in Europe, it was perhaps the first time it was ever witnessed on this continent…Father Corby stood on a large rock in front of the brigade. 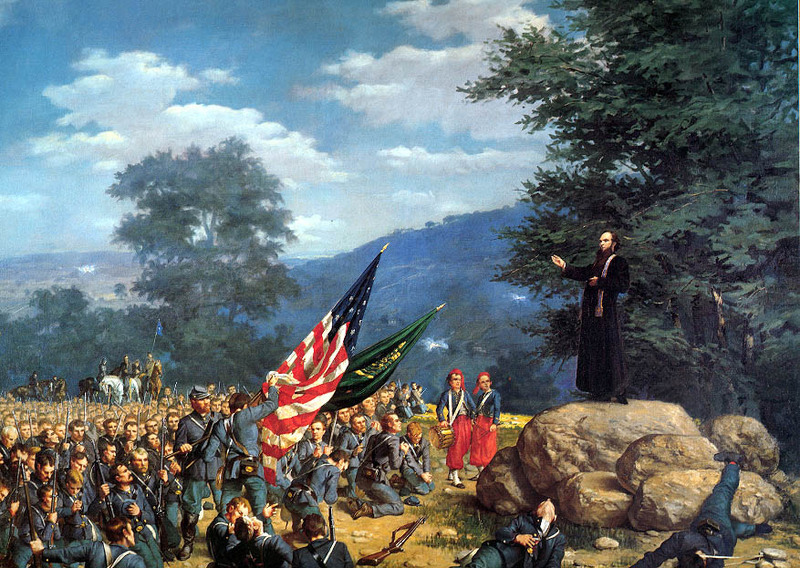 Addressing the men…reminding them of the high and sacred nature of their trust as soldiers and the noble object for which they fought. The brigade was standing at “order arms.” As he closed his address, every man, Catholic and non-Catholic, fell on his knees with his head bowed down…The scene was more than impressive; it was awe-inspiring. At about 5 p.m., Caldwell’s Division moved off by the left flank towards the Wheatfield. As they advanced, they encountered demoralized men of the V Corps who were either taking cover or moving towards the rear. Entering the Wheatfield, the Irish Brigade deployed in a line of battle and marched steadily forward. Beyond the open space was a wooded outcropping, strewn with boulders, known as Stony Hill. Men of the V Corps had recently abandoned that position and it was now thickly occupied by South Carolinians who quickly opened fire on the Irish Brigade. After about ten minutes, Colonel Patrick Kelly, commanding the Irish Brigade, ordered a charge. Irish and South Carolinians clashed in close combat on Stony Hill. Within a short time, the Confederates had either surrendered or retreated. Stony Hill, a key position on the crumbling Union left flank, had been reclaimed. But soon three Confederate brigades advanced on the Irish Brigade’s right, front and left. There would be no holding Stony Hill. A staff officer delivered an order to the brigade, “You are surrounded, retreat and save as many men as possible.” Such a command certainly did not help preserve what might have been left of morale and good order. The Irish Brigade made a rapid retreat back across the bloody Wheatfield. During the retreat, Col. Byrnes of the 28th Massachusetts personally carried the regiment’s colors, ordering the men from time to time to about face and fire into the pursuing Confederates. By the end of that terrible day the 28th Massachusetts was back on Cemetery Ridge in their previous position with the rest of the II Corps. However, close to half of the regiment was no longer with them. The 28th Massachusetts spent the night building up breastworks, expecting an attack in the morning. They hunkered down during the Confederate artillery barrage that preceded Pickett’s Charge and, remarkably enough, only had a few men wounded on July 3. Pickett’s Charge struck the center of the II Corps line well to the north of the 28th Massachusetts. The assault did not extend to their front, although the 28th Massachusetts did fire at the flank of the advancing Confederate formation, probably without much effect given the distance. By the close of the battle, the 28th Massachusetts had lost (almost entirely in the Wheatfield and on Stony Hill) 14 killed, 56 wounded, 23 captured or missing for a total of 93 casualties (or 42%). The regiment, the largest in the Irish Brigade, had played a key role along with their division, plunging into a massive gap in the Union line and checking a rapid Confederate assault. James L. Bowen, Massachusetts in the War, (1888), p. 420-423. Bradley M. Gottfried, Brigades of Gettysburg, (2002), p. 118. Mulholland quoted in William Corby, Memoirs of Chaplain Life, (1893), p. 182-183. Stephen W. Sears, Gettysburg, (2004), p. 289.